ARCHIVED LIVESTREAM – As braking systems become more technologically advanced, so do the problems that arise. 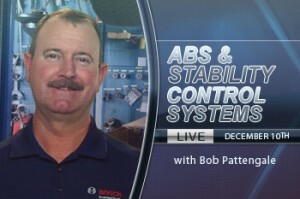 Bob Pattengale’s brake technology webcast sponsored by Robert Bosch, LLC. Bob covered ABS, stability, traction control and everything in-between to get those pesky problems with automatic braking and emergency assist repaired right and out of your bay in no-time.